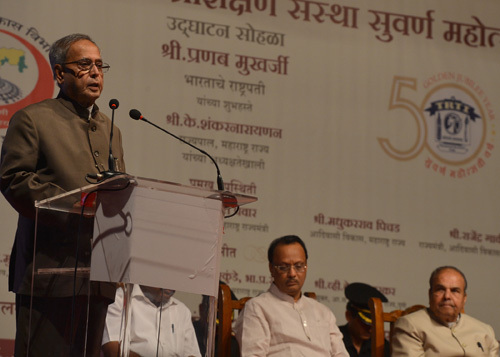 I am glad to be present here this evening to celebrate the Golden Jubilee celebrations of Tribal Research and Training Institute of the Government of Maharashtra. Fifty years is not a very long time in the life of an Institute, but it is long enough to reflect on where we started from, where we are today and to make plans and programmes for the future. From that point of view, let me congratulate this Institute for reaching an important milestone while catering to the cause of tribal welfare. This organization has provided necessary inputs to the State Government to design policies and programmes for tribal development. Our policy for tribal welfare is founded on the principles first enunciated by Pandit Jawaharlal Nehru. The crux of those principles is human development with conservation of the rich and diverse cultural heritage of tribal society. The notion of tribal welfare is not just about development of tribal communities through economic progress but a larger concept of lifestyle that fosters holistic living. Tribal communities are known to have customarily maintained a symbiotic relationship with nature, without ever exploiting natural resources. There is much to learn from their traditional knowledge systems. I am glad to note about the initiatives taken by this Institute in documenting tribal traditions and practices. Despite the rich heritage, tribal societies remained in relative ‘time freeze’ due to geographical isolation. Leaders of our freedom struggle understood the utter necessity of taking every Indian on the path of socio-economic emancipation, without which political freedom was meanigless. Thakkar Bapa coined the term ‘Adivasi’, which was endorsed by Mahatma Gandhi as a mark of respect for the tribal societies. Gandhi’s concept of Hind Swaraj had Adivasi as one of the eighteen elements for his constructive programme. After Independence, the principle of equity was invoked in the Constitution to uplift the tribal population through affirmative policies. The seventy third amendment to the Constitution bestowed special powers to the Gram Sabha in tribal villages and hamlets in decision-making and self-governance. I am told that to assist the Governor of Maharashtra in discharging Constitutional responsibilities as the guardian of Tribal Areas in the State, a Tribal Cell has been set up in the Raj Bhavan. This pioneering step will allow renewed focus on building capacities of governing institutions working in the Tribal Areas. At the same time, it will help safeguard the constitutional and statutory rights of the tribal people. Joint Forest Management Committees have played a key role in curbing the exploitation of forest resources that had often led to the marginalization and deprivation of tribal people. These committees have achieved considerable success in making the forest dwellers a major stakeholder for community-led forest plantation and conservation. The Government of India has also enacted the Forest Rights Act to recognize the traditional rights of forest dwellers for cultivation and collection of minor forest produce. It is gratifying to note that Mendha-Lekha, a small village of 450 people in the Gadchiroli District of Maharashtra, has become the first village in the country last year to get community forest rights for bamboo under this Act. It has monetized this right thereby generating income for the village and the tribals. I congratulate the Governor and the Chief Minister of Maharashtra for their personal intervention to facilitate this landmark event. Multi-pronged measures toward socio-economic empowerment have had a salutary effect in tribal areas. Still, many tribal blocks continue to rank low on human development indicators. The Tribal Development Administration has to focus on human development apart from according primacy to survival issues. There has to be coordinating mechanisms cutting across different departments and agencies to ensure effective delivery of services. Integrated Tribal Development Projects have to be fully empowered - financially and administratively - to become real change agents, ensuring effective implementation and reaching out to tribal people at their doorstep. Information and Communication Technology has to be used extensively to improve the reach of schemes and programmes. To ensure benefits of tribal development programmes reaching the genuine tribal people, there has to be proper scrutiny before bestowing a group the status of scheduled tribe. This Institute, as one of its key functions, is applying sound anthropological principles to determine the tribal characteristics of a group. I am also aware of the progressive step taken by Maharashtra to set up quasi-judicial ‘tribe validity scrutiny committees’ under this Institute to prevent non-bonafide groups from taking benefits meant for tribal people. Tribal Development, as one of our pressing priorities underlines the need to strengthen the existing institutions. It calls for addressing the development and administration deficits in tribal areas to improve human development parameters of the tribal population. There are a multitude of national and state level organizations working towards tribal development. A wider convergence mechanism at the policy level is required to leverage the resources available. I am pleased to know that autonomous status is being envisaged for the Tribal Research and Training Institute. This Institute must promote linkages between various research organizations working on tribal development and prioritize research areas. The tribal customary laws must be codified to enable statutory provisions being exercised effectively for mitigating vulnerability of the tribal people to any exploitation. Periodic assessment reports must be brought out to advice the administration on the implementation of tribal development programmes. More institutions like yours must be nurtured. Funds to research organizations to study tribal issues must be enhanced. This will help systematize and prioritize tribal development planning. In conclusion, I would like to say that there is much to learn and appreciate from the tribal societies. At a time when the entire country is gripped by concerns about women’s safety and security as well as by moral challenges, a peek into gender behaviour and relations in tribal communities hold significant lessons for the society at large. As much as we ought to learn from tribal people, we have a duty to empower plural tribal streams and contribute to that guiding spirit of our Constitution: "We the People of India”. I once again compliment the Tribal Research and Training Institute on this historic occasion and wish them good luck for their journey ahead.